What is territorial aggression, and how can it be diagnosed? Territorial or protective aggression may be exhibited toward people or other animals that approach the pet’s property. Generally, people and other animals that are unusual, less familiar to the dog, or most unlike the members of the household are the most likely “targets” of territorial aggression. “Something different about the sight, sound, or actions of the stimulus is causing an alerting, anxious, or defensive response on the part of the dog. How can territorial aggression be prevented? Territorial aggression can be prevented or minimized with early socialization and good control. Young dogs should be taught to sit and receive a reward as each new person comes to the door. To reduce potential fear and anxiety toward visitors, you should ensure that a wide variety of visitors come over to visit the puppy while the puppy is young and developing its social skills . In time, most dogs will begin to alert the family by barking when strangers come to the home. However, the dog that has been well socialized and under good control can be trained to quickly settle down and relax. Why are territorial behaviors ongoing and perhaps even increasing? For many dogs, territorial displays are a normal part of their behavioral repertoire. While any dog may show territorial responses, certain breeds of dogs have been bred for guarding and watchful behaviors. Without appropriate supervision, owner interaction and training of appropriate responses, these dogs may engage in territorial displays that vary in intensity from mild barking to intense displays that might include growling, snarling, lunging, piloerection and even biting a person or animal entering the territory. Opportunity and environmental access to the stimulus will influence whether the behavior will take place. Without proper owner supervision and training, these behaviors may become excessive. 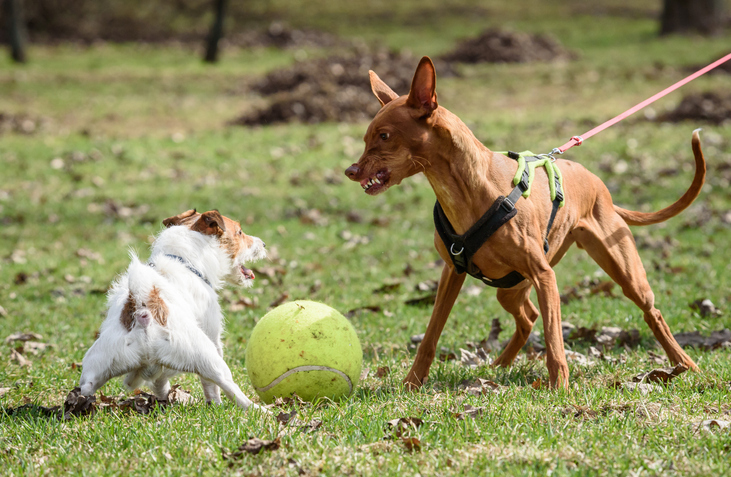 Dogs that are tied may show extreme territorial behaviors and aggressive responses. Dogs that are left outside all day without owner supervision are also at risk for developing escalating territorial responses. Many dogs that show territorial responses are often fearful and anxious and just want the intruder to leave. The longer the person stays within the territory, the more aggressively aroused the dog may become. The goal of the territorial display is to get the “intruder” to leave. If the pet is frustrated from chasing the stimulus away because it is tied, penned, or behind a closed door or window, then the longer the stimulus remains in place within sight or hearing of the pet, the greater the anxiety. Although dogs with mild fears might habituate with continued exposure, dogs that are constantly exposed (flooded) by an anxiety-evoking stimulus will have their fear heightened until the stimulus leaves. The removal (retreat) of the individual then further reinforces the strength of the response. Should I punish my dog for his aggressive displays? Often the first strategies people try are related to punishment: yelling, scolding, startling, or any physical punishment may be effective in interrupting a dog’s aggressive display. There may be some serious long term side effects of this approach such as fear, increasing aggression and anxiety and a decrease in the occurrence of warning signs from the dog. Repetitive use of punishment in association with approach of unfamiliar people can create an association that it is threatening to have unfamiliar people around. Punishment may stop the dog from displaying aggression but it will contribute to the anxiety, fear and need to protect. Because the warning displays have been suppressed, the result is a dog that doesn’t bark but that may indeed bite without the aggressive display. The aggressive encounter is dangerous and surprises people making the dog seem unpredictable and unmanageable. In fact these bites are a function of training a dog to inhibit territorial aggressive displays by punishment, thus giving the appearance that the dog accepts the approach of the intruder. It is more effective to teach the dog what you do expect him to do when someone comes over. How can I treat territorial aggression? For dogs exhibiting territorial aggression, you will need to gain enough control to have your dog sit, stay, and when calmed down, take a reward at the front door. Teaching the dog to settle on command near the vicinity of the front door is an essential first step (see Teaching Calm – Settle and Relaxation Training). If the dog cannot do that, then they must be removed from the area before admitting people into the home. Providing safety for any individuals who must come to the home is essential . If the dog is showing territorially aggressive responses to visitors, it must be removed and securely confined when company is present to avoid injury. If redirected behavior is a component of the initial problem, it may be necessary to separate dogs to prevent fighting and injury if the problem dog encounters the stimulus. Owners should not reach for the dog when he is aggressively aroused to avoid injuries to them. If barking precedes the aggression, you might be able to stop the sequence of events and train the dog to settle with products that inhibit barking, such as the bark activated citronella collar or a handheld alarm . However, you must be present to immediately reinforce the quiet and settled behavior with a favored treat or reward. “Punishment must be stopped because punishment tends to increase rather than decrease the anxiety and fear that may be underlying the behavior. Another essential first step is to no longer allow territorial aggressive displays to continue. An effort should be made to prevent ongoing territorial displays either at windows or along fence lines. This might mean blocking visual access out windows by covering them up or preventing the dog from getting to them, and not allowing outdoor access unless the dog is wearing a leash and head collar and is actively supervised by an adult who is holding onto the dog’s leash. Punishment must be stopped since punishment tends to increase rather than decrease the anxiety and fear that may be underlying the behavior. Once your dog can settle on command, more specific training can occur. All the stimuli that provoke the territorial response should be identified and a response gradient determined. That is, at what distance is the territorial response noted, and how does the response vary with changing distance (approaching and retreating)? Using a desensitization and counter-conditioning program (see Desensitization and Counter-Conditioning and Implementing Desensitization and Counter-Conditioning – Setting Up for Success), you can begin retraining with low levels of stimuli. For territorial aggression, low-level stimuli may include people arriving in a car, walking past the front of the house, or perhaps even a family member knocking on the door or ringing the bell. The idea is that each time someone arrives at the house or rings the bell, the dog will come to expect a favored reward (toy, cheese, hot dog slice, or play session). Once the dog can be controlled and receives rewards in this environment, gradually more intense stimuli can be used. Could Your Dog’s Water Bowl Make Him Sick? Here’s What You Need To Know Melatonin for Dogs: Benefits, Safety, Dosage and More!